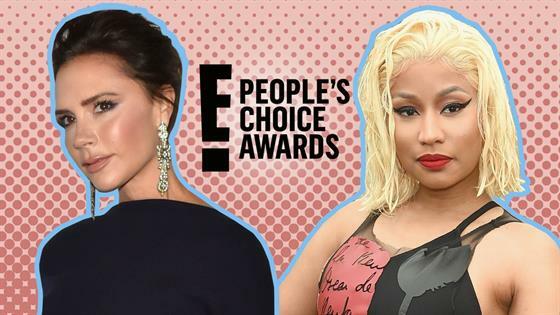 The Bella Twins are taking over the 2018 People's Choice Awards! As the countdown to the official ceremony continues, E! 's very own Nikki Bella and Brie Bella graced us with their presence and (of course!) an exclusive interview with the one and only Giuliana Rancic. After a quick fan-girl sesh, the inseparable sisters got right down to business in explaining just how important it is to attend the PCAs and catch up with fellow members of the E! family like the Kardashian sisters. And when asked who they're dream wrestling competition would be, it didn't take long for Nikki and Brie to call out Kim Kardashian, Khloe Kardashian and Kourtney Kardashian to a friendly match. "I honestly think what would be really good is the Kardashians! Sisters versus sisters!" Nikki shared. Brie agreed, telling Giuliana, "The Kardashians versus the Bella twins. I think that's a good match." As for tonight's festivities, we can't help but shout out Nikki and Brie's showstopping ensembles. The Total Divas stars walked the red carpet inside Santa Monica, Calif.'s Barker Hangar in looks any fashionista would lust over. Nikki, who documented her champagne-filled glam session on social media, rocked a spicy red gown by Dundas and Bella looked oh-so elegant in a black and white jumpsuit by Self Portrait. On if they ever accidentally show up in the same outfit, Nikki said it's never happened and considers it a lucky "twin thing." Nikki is nominated not once but twice for a People's Choice Award, having been named a finalist in the Competition Contestant of 2018 and Reality TV Star of 2018 categories. In the latter competition, Nikki faces off against Khloe Kardashian (Keeping Up With the Kardashians), Antoni Porowski (Queer Eye), Joanna Gaines (Fixer Upper) and Paul "Pauly D" DelVecchio (Jersey Shore: Family Vacation). Recognized for her skills on the dance floor during the season she competed on Dancing With the Stars, fellow nominees in the Competition Contestant category include Maddie Poppe (American Idol), Brynn Cartelli (The Voice), Cody Nickson (The Amazing Race) and Eva Igo (World of Dance). The WWE wonder woman always gets our vote, but tonight... the power rests in the hands of the people. Check out the complete list of winners—updating in real time—right here!